Welcome back! Things have settled down since our vacation and I've finally had a chance to play with some of the new Simon Says Stamp This is the Life Release. 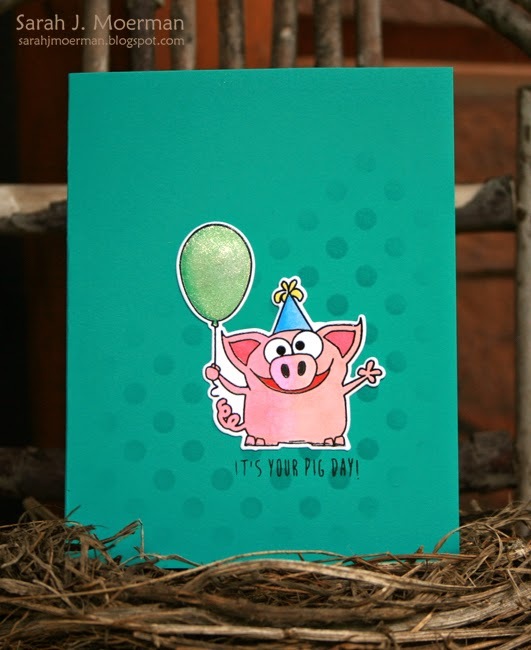 Today I'm showing a couple of cards I made using the new Simon Says Stamp Party Animals stamp and die set (supplies listed below my cards). I tend to be drawn to more graphic/geometric shapes and patterns when picking out stamps. I rarely buy 'picture' stamps...but I just couldn't resist these cuties. I also recently bought some Spectrum Noir markers so I figured I had to bite the bullet and (*gasp*) COLOUR! (I'm no pro so please be gentle). 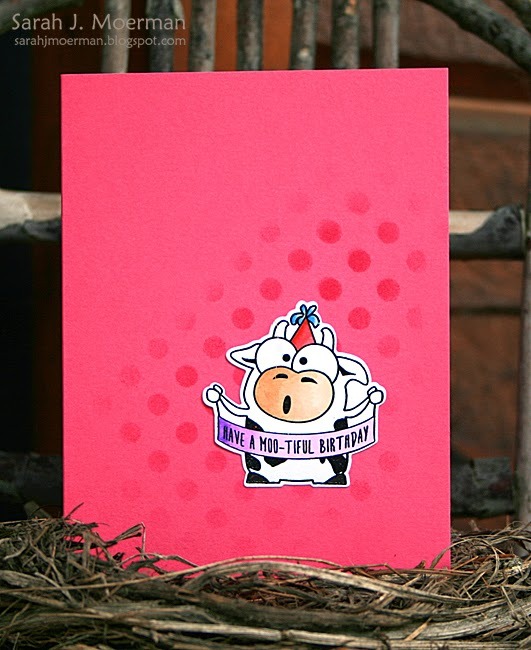 ;) I used the Simon Says Stamp Medium Dots stencil and some ink to add a little interest behind these adorable farm critters but really wanted them to be the main focus of the cards. I'll be back later this week with another card using the new Simon Says Stamp This is the Life Release. Love both cards, so cute!!! Congrats, Chitra! Please email me with your shipping info so I can pass it on to the good folks at Simon Says Stamp. Thanks everyone for stopping by. Hopefully I'll have a card or two to post next week. Before I get started with my cards I just have a reminder that you can pick up the August 2014 card kit HERE for just $24.95 + shipping. Or if you’d like to receive this kit and future kits for only $19.95 + shipping per month, you can SUBSCRIBE HERE. I also have an extra Simon Says Stamp August 2014 Card Kit to give away thanks to sweet Heidi, owner of Simon Says Stamp! Just leave a comment on either of my August 2014 Card Kit posts by the end of Wednesday July 23rd and I'll announce a winner on the 24th. 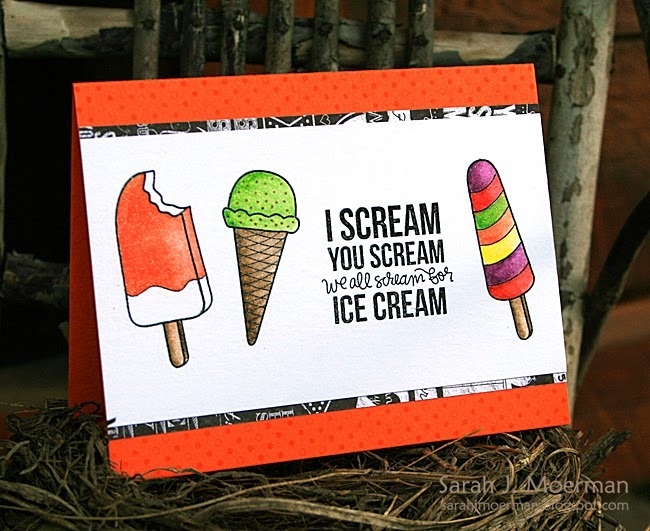 For my first card, I paper-pieced the popsicles using some of the patterned paper from this month's card kit. I then went over the "edible" parts with Glossy Accents. For my second card, I stamped everything with Versafine ink on the piece of Tim Holtz Distress Watercolor Cardstock that comes with the kit before clear heat embossing (I used the smooth side). I then used Tim Holtz Distress Markers to add color and my Wink of Stella Clear Glitter Marker for some blending. I've got to tell you, I LOVE the Tim Holtz Watercolor Cardstock. This was my first time using it and I will be ordering more. I had no problems with pilling or blending. Before mounting my watercolored panel on my card, I took the card base (made from the Simon Says Stamp Orange Peel Cardstock) and stamped the dotted border stamp along the top and bottom for a tone on tone effect. Just a reminder that you can pick up the August 2014 card kit HERE for just $24.95 + shipping. Or if you’d like to receive this kit and future kits for only $19.95 + shipping per month, you can SUBSCRIBE HERE. 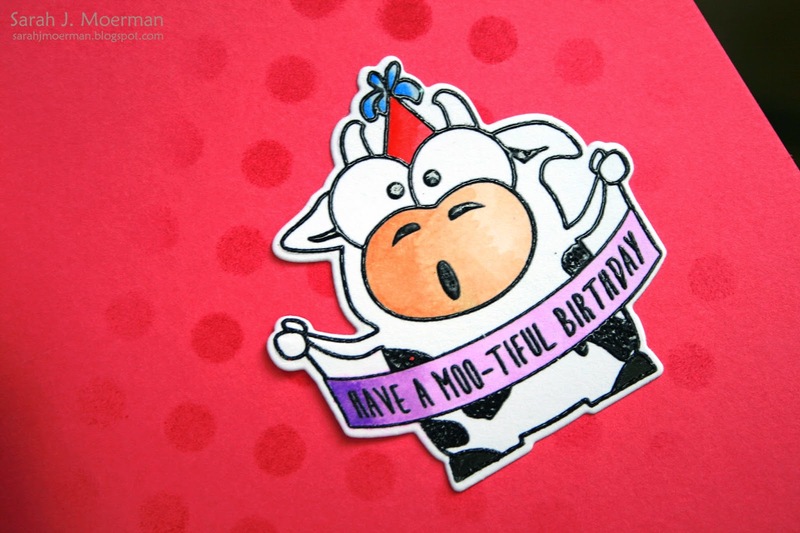 Simon Says Stamp August 2014 Card Kit...and a GIVEAWAY! 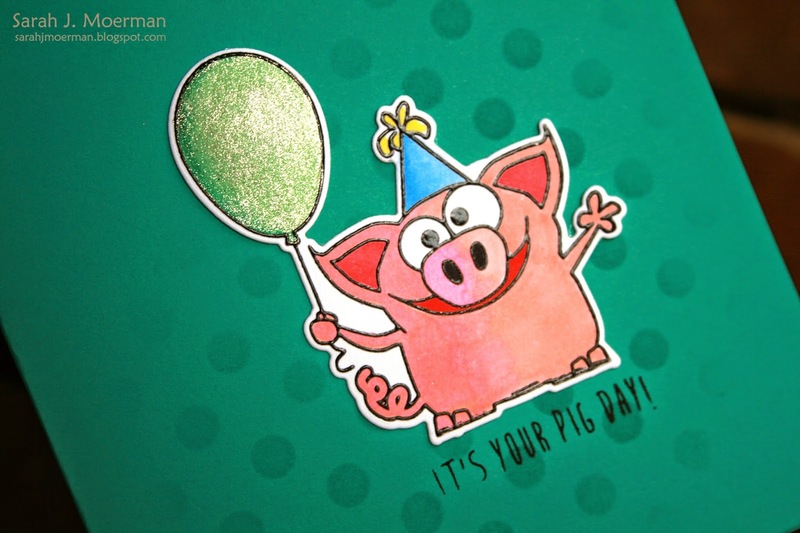 Today I'm sharing a couple of cards made using the fun new Simon Says Stamp August 2014 Card Kit. I love the bright, summery colours and the adorable stamp set in this month's kit! 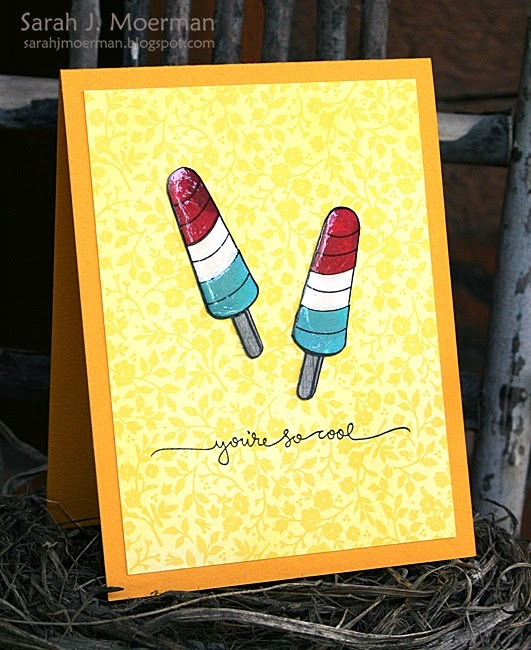 For this first card, I took the small striped popsicle stamp and turned it upside down to create candles. :) I white heat embossed the image 3 times and coloured the candles in using the Peacock Feathers Distress Marker that came in the kit (along with the Picked Raspberry Distress Marker I already had on hand). I then used the Squeezed Lemonade Distress Marker that came in the kit (along with the Ripe Persimmon Distress Marker I already had) to create the flames. I coloured over the flames with a Clear Wink of Stella Marker and coloured the wicks with a black marker. I then stamped the sentiment and pieced the rest of the card together. 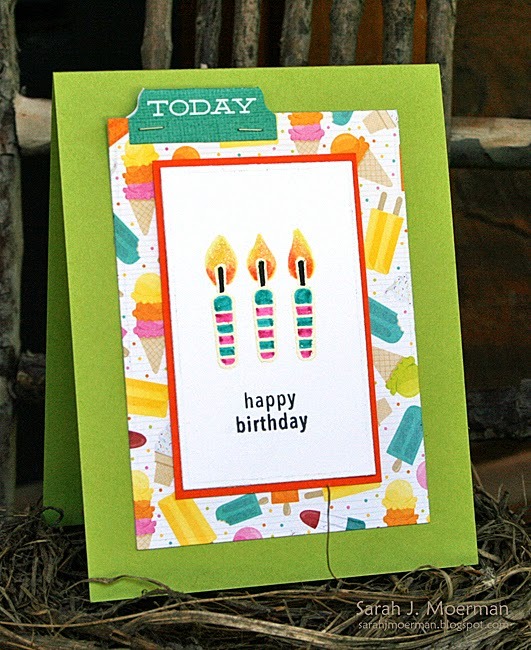 The 'today' label was one of the random summer themed embellishments that came in my particular kit. I attached it with my Tim Holtz Tiny Attacher. For my second card, I pieced some of the Bo Bunny Lemonade Stand patterned papers together on a card base made from Simon's Sunshine Cardstock. I took the Squeezed Lemonade Distress Marker and scribbled it over a scrap piece of cardstock before stamping the top of the ice cream cone and the smiley face on it to create my sun. 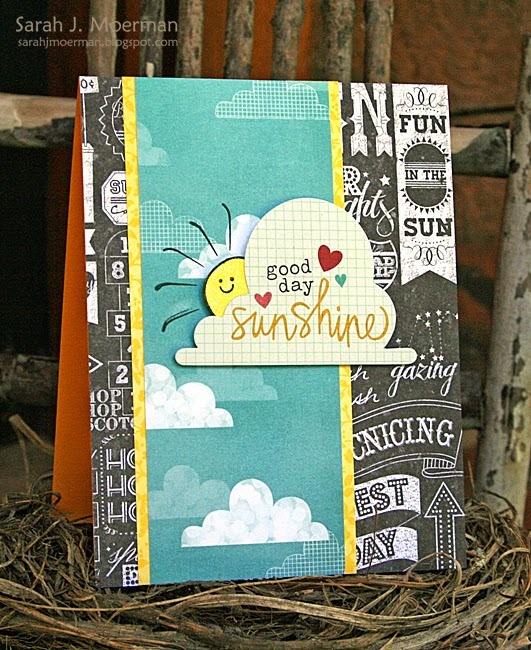 Once I cut the sun out, I tucked it behind the 'good day sunshine' piece which was also one of the summer themed embellishment pieces that came in my kit. I used the beginning curvy part of the 'you're so cool' sentiment to create my sun rays. You can see I 'oopsed' with the bottom ray but I'm going to call it 'motion' from the heat ray. ;) I adhered the cloud/ sun piece using foam adhesive.